Lockable fuel plug made of steel, polished. High quality sparepart with ventilation. Delivery inclusive rubber sealing and two keys. New produced sealing cap fit to old front flasher lights of Trabant 500 and 600 (P50/60), Barkas B1000 and Multicar truck and fit to Wartburg 311,312,313 and Framo, and fit to the side lights of the camp trailer INTERCAMP. Grip rubber for mountig at the ignition key. This spare part is an original one. Fit for the vehicles: Trabant, Wartburg, W50, Barkas LO, LD Multicar usw. Delivery only at advance payment. You have to tell us your key number per email, fax or letter. Keys for the vehicles: Trabant, Wartburg, W50, Barkas LO, LD Multicar usw. 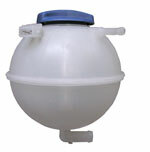 Plastic cap with mounting sprap for the water bottle of the windscreen washer system. The plug close up the refilling hole. To use at many reservoir bottles with electrical or mechanical pump. Sealing cap to protect the starter wire (plus) against dust and moisture. Fit to the vehicles: P70, Trabant, Wartburg, Multicar, Framo and Barkas. Universal useable plastic connection tube for coolant hoses. Best use for reparations of demaged hoses or tuning and modifications z.B. Trabant with Wartburg engine or VW engines. Easy to install, just push the two ends of the hoses at tube and fix it with two clamps. Scope of delivery complete with closure cap and integreated valve and switch for fluid lavel. Two connections for the water hoses.